What is wrong with you?! Why do you have no respect for your wife? Do you really want your wife to slave by vacuuming the house everyday? I suppose that you think that it’s her job. Why don’t you get off your rear and do a little help? If you are the lazy man I imagine you to be, then you should be thankful that there is something that can help your wife with the housework and is cute at the same time. It’s not your wife’s job to agree with you and you are old enough to not wet your bed. If you damage it, she will know that you did it on purpose so I hope that if you do, she throws you out of the house. Maybe if you showed a little more appreciation for the things that she loves, you would enjoy seeing Hello kitty everyday. I saw step on the thing “on accident” and throw the remains in down the trash chute. Doesn’t it make noise while working? Something like that would keep me up all night and I would then be forced to destroy the damn thing. Good to see your rants. It is almost seeing an old evil friend from high school after years. I’m a bit amused that not a company from Japan but Roomba (Massachusetts company) decided to use HK to promote their products. I found people were saying that Roomba is useful if you have pets in your house as it can pick up pet hairs. I’ve gotta have it! I’m a clean freak and it’s so adorable. Besides Mr. HKH you can program it to go on and off as you wish. You don’t need it to be on all night unless you and Mrs. HKH are pigs! Ok, I’ve come to the conclusion that darlene is Mr. HKH’s wife. I love the idea of having a Roomba to help me along in my housework, but the idea of spending so much money for it just didn’t seem worth it, untill… lol! Yes, seeing HK on a Roomba has just about changed my mind, except for the fact that I really don’t like the retro HK image. It it was a current HK image and pink, then I would totally get it 🙂 I’m such a HK fan! @Darlene: I wouldn’t call vaccuming the house slave work, annoying yes, but really not a big deal. And if you really want to go there, then for the price of buying this Roomba Mr. HKH can pay someone else, like a housekeeper, to really clean up his house, top to bottom, and then take his wife out to dinner. That is wayyyy better than buying that Roomba. Any wife, or live in girlfriend for that matter, would agree that’s a better way for thier man/hubby to show thier love and appriciation for them. Are this things that expensive? > what’s a roomba exactly? Guys from MIT spending decades studying robotics but couldn’t find any good use of their knowledge to make a business. Finally they came up with was a robotic vacume cleaner. This is what my friend told me. The problem is the vacuming is not so powerful. So, if you have a hardwood floor and if you have pets inside, then this gadget may do a job for you. Of course, this won’t climb the steps. Roomba’s don’t work very well. Adult (meaning target audience, not, ah, adult only interest) marketting tat is all pointless, over-priced and sub-standard. Why does this thing seem so much less than surprising? Can’t understand why everyone is going on about the $. Theres a few choice things she can do in the morning to make sure you are fully awake… She owes you EVERY morning anyway for being a HK freak. Seriously, she must be an f’ing goddess in bed or something, cause that has to be the reason you haven’t divorced her yet. cleaning lady – dressed as hello kitty….. I sort of see an idea of the Roomba if you have an indoor cat or there’s a lot of dirt tracked in. But yeah, I kind of wonder if there’s spending too much on a cleaning appliance. I mean, a freaking Dyson is about 500-600USD. Geez! I mean I am sure it is a great vaccuum, but man! Dysons are $500 to 600 US!! That’s even worse than the UK prices, despte the 17.5% sales tax! I’ve passed up many a thing because it wasn’t something I needed… otherwise I’d still be sleeping in a twin bed just to have HK sheets with an HK humidifier next to said bed. Oh, and I’d be broke! The Dyson is worth every penny. Cleans like a gem! Dear god! Anything that zip and zap around my house all by itself is bad news especially in the morning (and that include my sweet dog). And I bet the HK version of that useless gadjet cost double the price of the non HK one. Vell, das vacuum works fine..
Roomba’s are really cute! <3 HK is an unecessary feature. Well. Look on the bright side. The feline will be doing something helpful for you. You put your feet up and watch the little feline work away vigorously. She hardly ever seems to ave an opinion on cheap HK knockoff items. Hmmmm…..
piss in the futonn, HAHAA Hilarious!!!! I just had to comment on this because it seems like most (if not all) the people posting comments about the product have never actually owned a roomba, they work great! I’ve owned mine for a couple of months and have had no problems, I hear storys of it getting stuck once in a while (hasnt happened to me yet) in tight spots or wires but meh, when the time comes not such a bid deal. As far as cleaning powers go these things seriously pick up a lot and my place looks cleaner then ever, lol then once its done its job itll automatically go back to the charging station for the next day. 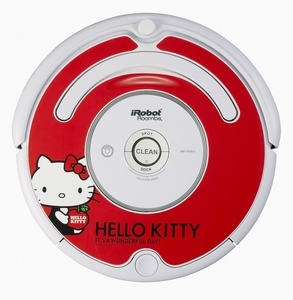 Living on my own i never vacummed, & now that I have a roomba..I still don’t, but at least my place is clean :D.
hey isnt Irobot the movie where robots take over the world perfect since thats what hello kitty is doing.